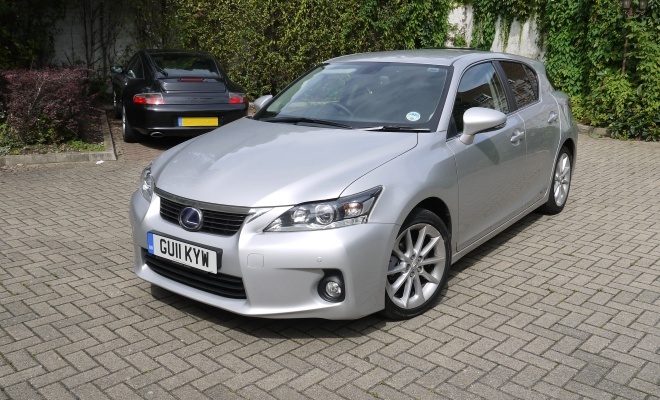 Lexus got in touch a short while ago to arrange a loan of one of its cars. The company is currently keen to reach out to bloggers, it seems, and wants to foster three brand associations, namely fashion, environment and luxury. Clearly I fall into the middle of those three buckets, given my unarguable shortfalls in the other two. 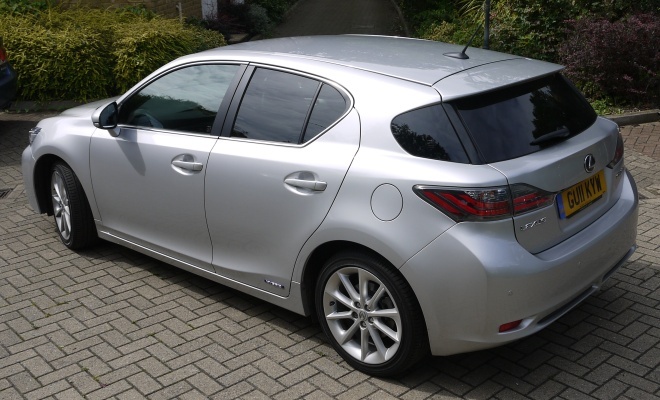 I elected to borrow a CT 200h, Lexus’s smallest and most economical model. It’s still a substantial car for its class – the posh end of the medium hatchback sector – and is certainly more spacious than the main competitor it hopes to undermine, the second-generation BMW 1-Series. A day of diversions has been arranged for me and the car, which I’m not entirely sure about. But I have an open mind, I’ll go with the flow and see what happens. The car arrives promptly at 11am and immediately gains a couple of scars. The entrance to the GreenMotor car park is via a narrow gateway and the unfortunate delivery driver succeeds in clonking a door mirror and scraping an alloy on the way in. In the past I’ve squeezed through cars 20cm broader than the 1.8-metre Lexus, but then I’ve had plenty of practice. Power folding mirrors might have helped but they’re not part of the package in this mid-spec £25,200 SE-L model. You have to step up to the £30,635 SE-L Premier to get powered ears as standard, along with all sorts of other toys. After a quick familiarisation briefing and handover of the keyless key, it’s time to hit the starter button, disengage the foot-operated parking brake and head back through the gate, parking proximity sensors squawking. My car has the optional navigation pack, which provides a large flip-up screen in the middle of the dash that’s currently painting yellow warning flashes on both sides of the car’s silhouetted nose. 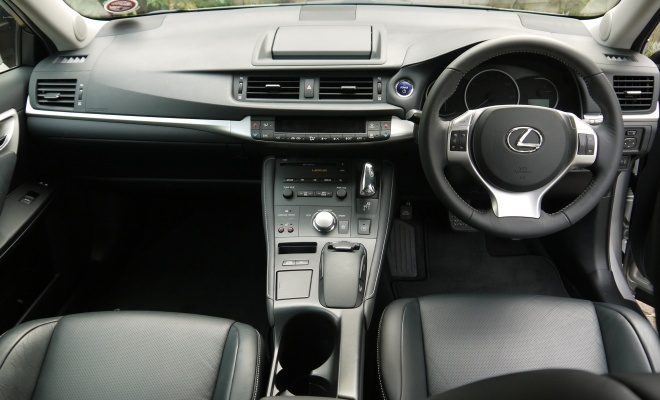 This £1,850 option also includes a handy reversing camera, 6-CD stereo, a centre console controller that’s like a mouse mated with a joystick, and some excellent hard-disk-based satnav software. But then it should be excellent for the price. The satnav has been pre-programmed, and the first stop is Allpress Espresso in Shoreditch, for brunch. This is evidently the fashion part of the day, as the trendy clientele are all decades younger than me and most are wearing big hair and falling-down jeans. The place is heaving, but fortunately Claire from Lexus is there to meet me and has nabbed a table. I don’t drink coffee, so miss out on an apparently wonderful brew, ordering instead a juice and a breakfast plate. Clearly sausages and bacon are decidedly old hat, as what arrives a while later is a plate of toast, cold boiled egg, air-dried ham, sliced cheese, raw tomato and half an avocado. From my seat I can see the parked Lexus, which is almost as uncomfortable a mishmash as my meal. The front is pointy, the sides slabby, the back blocky. I remember seeing it launched at the 2010 Geneva motor show, watching it revolve slowly on its turntable with camera in hand, waiting for an attractive angle to appear. And waiting. And waiting. Fortunately, from the driver’s seat you can’t see the bodywork. Instead there’s a pleasing sweep of soft-feel dashboard, a small wheel trimmed in smooth stitched hide, uncluttered instruments beneath a leather-trimmed cowl and a broad, flat central console. There are a couple of large cupholders between the front seats, sitting ahead of a central armrest that’s set a little too far back for the average elbow. It should be further forward and might perhaps have hidden the ugly cupholders for good measure. But that area aside, the interior is comfortable, classy and well-judged. I’ve waved goodbye to Claire and am ploughing on to rendezvous two, with tour guide Hedley, who’s going to show me around some of the environmental highlights of the 2012 Olympic site. This is the eco part of the day, clearly. On my way the heavens open briefly, allowing me to verify that Lexus rain-sensing wipers do indeed sense rain, and the subsequent lack of it, a rarity in my experience. Threading through the traffic from Shoreditch to Stratford gives me more time to acclimatise to the car. The CT-200h is a hybrid, sharing many of its mechanical parts with the cheaper and more prosaic Toyota Prius. The Lexus’s sprung transmission selector is trimmed in chrome rather than blue plastic but will feel familiar nonetheless to anyone who’s driven a Prius due to its unusual toggle action. Nestling nearby is a rotary controller that lets you switch among three driving modes – normal, eco and sport. The Lexus weighs almost 1.5 tonnes and can muster only 134bhp, so sport is a relative term. But selecting sport mode does noticeably sharpen throttle response and firm up the steering, and makes maximum use of the batteries and 79bhp electric motor to supplement the 98bhp petrol engine. 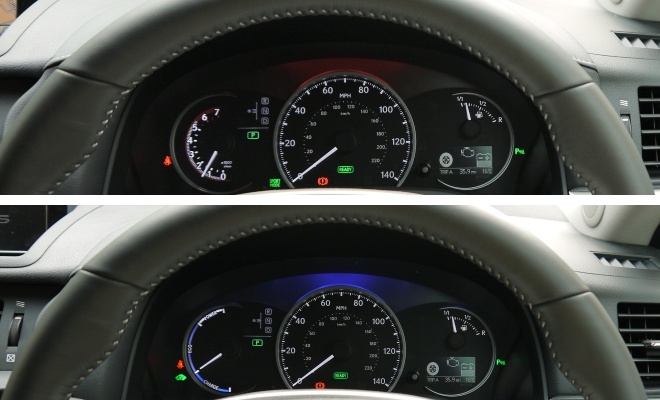 The instrument lighting switches from blue to red and the economy meter disappears, replaced with a tachometer, to underscore the change in personality. It feels urgent and eager to me although the 10.3 seconds taken to reach 62mph time won’t win any medals for sprinting. And the tacho is pure decoration since the CVT gearbox robs the driver of any ability to control the revs, although sport mode will keep revs higher for longer. At the other extreme, eco mode blunts throttle response and caps acceleration to a startling extent, making the car feel as if it might be anchored to the road by a bungee cord. It will save fuel, no doubt, but eco mode makes the car a little too slow to respond around town for my liking. On faster stretches, though, it’s perfectly acceptable and worth considering. In the middle there’s normal mode. Response remains lively, power is there when it’s needed at the end of the throttle, and the car will do its best to cut fuel consumption by switching among engine, motor or both as demands dictate. At low speeds and setting off from a standstill, the car operates in electric-only EV mode. My eco tour starts in electric mode too, with a short train journey from Stratford to Hackney Wick. From the high vantage point of the station bridge you can get a great view of the aquatic centre, among other Olympic buildings. Apparently the spectator wings will be disassembled after the London games and shipped on to the next games in Rio, along with various other temporary buildings such as the basketball arena. No doubt Toyota would approve, given its repurposing of underpinnings to power the Prius, CT 200h and Auris Hybrid as well. Sadly we can’t actually venture into the Olympic park as it’s still a hard-hat building site, but Hedley is a mine of information and skilled at finding elevated areas from which to point and discuss as we tour the park’s razor-wire boundary. He’s also an authority on the local graffiti, pointing out the toothy trademark of a nocturnal sprayer called Sweet Toof, the addle-brained ape favoured by Mighty Monkey and the gilded trademark of Gold Peg, all of which are much in evidence. I can’t quite see the eco connection of furtively squirting solvents at walls, but never mind, Hedley seems happy. Tour over, it’s back to the Lexus, which squirts out admirably little, at least according to its official test score – 94g/km of CO2 – which earns the CT 200h a free tax disc, zero showroom tax, 10% BIK rating for company car drivers, and a very welcome exemption from the London Congestion Charge. Those perks are perhaps the car’s strongest selling point, although I do find the car is growing on me in other ways. The design is starting to gel a little more with familiarity. The odd semi-estate proportions make more sense once you’ve sized up the legroom and headroom from the back bench, or opened the boot (which is capacious for the class despite the bulky hybrid battery). The car is never going to look elegant, but it is at least distinctive and assertive. Next stop is Kings Cross, where I must meet Mrs GreenMotor, returning from a couple of days in Edinburgh. I find a tight parking space and am grateful for the sensors that are standard across the range, the optional rear camera and good all-round visibility. The windscreen is more upright than the Prius’s wedge, making for much better-positioned A-pillars. I’ve already made up my mind about the CT 200h’s biggest flaw, and wonder if my other half will agree. She immediately notices the ill-positioned armrest, but that’s not it. We join the bustling traffic on the Euston Road, heading west for our next Lexus-sponsored appointment – dinner at The Glasshouse restaurant in Kew – while she tries to spot anything else untoward. I once read that improved sound quality in a cinema fools the brain into thinking that the pictures on the screen are sharper and clearer too. The mind is a convoluted and interconnected thing, which is the only explanation I can think of for Mrs GreenMotor’s comment, a few minutes later. “It’s got a really smooth ride,” she announces. Which flatly contradicts my top flaw – an unnecessarily firm setup that, to my mind, has the whole car dropping into every crevice in the road. In most others ways, the CT 200h is very refined, which hopefully explains our difference of opinion. You can just barely perceive the engine running, at normal speeds. The aircon is as silent as a Victorian child. The soft door seals keep out almost all traces of extraneous noise, and the power delivery is entirely bereft of lurch. But on 17-inch alloys and rubber-band tyres, on London’s scabrous roads, smooth the ride is not. Perhaps it’s the absence of noise that has played tricks with her faculties – for even as the too-stiff suspension jumps about like a pogo stick, it does so supremely quietly. If I were buying, I’d want to try the car on the no-charge optional 16-inch wheels, described in the brochure as “optimised for a refined and comfortable ride”. They may look unfashionably small but your spine will probably thank you. My better half, meanwhile, would be happy with the bigger default rims. An hour later we reach Kew, and enjoy a gorgeous meal, beautifully cooked and graciously served. Very obviously, this is the luxury component of the day. The menu, appropriately, is European but contains hints of Japan – Mrs GreenMotor starts with seabass sashimi with wasabi mayonnaise while I choose miso-glazed guinea fowl with edamame beans for my main course. On reflection the food is not actually so appropriate, for while the Kokura-built CT 200h must square up against European competition from BMW and Audi, it is itself more of a steak and fries kind of car. That parking brake, those cup-holder buckets – both serve as reminders that Lexus stands for luxury exports to the US. We feel suitably spoiled as we head back to our not so luxurious east-end home. 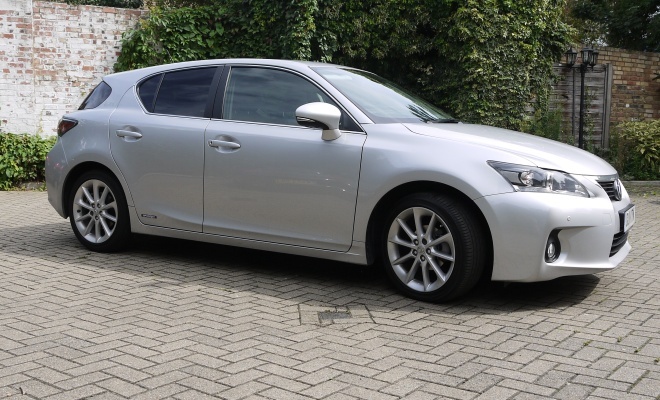 The Lexus mystery tour is over, but I still have the car for a couple of days, and manage to put some motorway, A- and B-road miles under its wheels. When I eventually hand the car back, the trip meter displays an average of 55mpg, which falls well short of the official economy score of 68.9mpg but is nonetheless a pretty good result in my book. 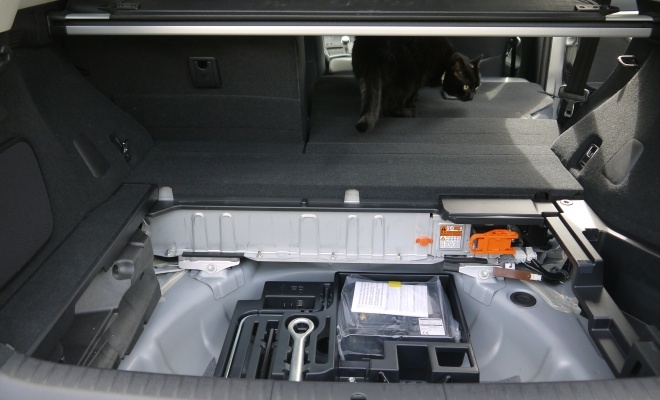 Both of us are sorry to see the car go – more sorry than I’d have predicted beforehand. Some cars look the business but deliver only disappointment. The Lexus is the opposite: a gawky grower. If I had the money for a bit of fashionable, eco luxury, I’d be quite tempted. Alas I don’t have the cash. But give it a couple of years and maybe my fortunes will have improved. Or, more realistically, there’s always approved used.